Li Luoneng (Chinese: 李洛能) (1807–1888) was a Chinese martial artist from Hebei province. He was also known as Li Feiyu, Li Nengran, Li Laonong, and Li Neng Jang. He was also nicknamed "Divine Fist Li". He learned the internal martial art of Xinyiquan (Heart and Intention Boxing) from Dai Wenxiong, son of Dai Long Bang, and later modified the style into Xingyiquan (Form and Intention Boxing). In 1836, he already excelled in the martial arts of Tongbei and Gongliquan. However, he wanted to learn Xinyi, so, he traveled to Shanxi, because he had heard of Master Dai Wenxiong, son of Dai Longbang, one of the two famous Dai brothers, the other being Dai Linbang, who were teachers of Xinyi. Over a period of time, Dai Wenxiong refused to teach the newcomer. But such was Li's determination to become a student, that he found a plot of land and started a farm so he could stay in town. In the farm he grew vegetables, and every day he would deliver his product to market, but to the Dai family, he would deliver it free of charge. This display of determination and sincerity finally persuaded Dai Wenxiong to take him on as a student. Li Luoneng practiced with Master Dai for ten years, and went on to become one of the best-known Xingyi Masters of his time, as well a popularizer of the art. Li Luoneng introduced a number of variations to the style he learned from his teacher. He replaced the splitting fist piguaquan with a palm strike. He also changed the name xinyi (Heart and intention boxing) to xingyi (Form and intention boxing). Later he had a number of students, the most famous of which was Guo Yunshen. Guo Yunshen in turn was the teacher of Wang Xiangzhai, who popularized the qigong exercise known as zhan zhuang (post standing). 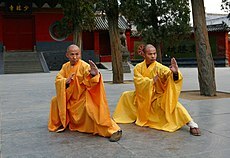 The legacy of Li Luoneng is a rich and varied martial art that emphasizes practicality and effectiveness. His fame is perpetuated by his numerous famous students. ^ Wu Dianke and Cheng Suren. "Old Farmer Li". Retrieved August 30, 2009. ^ Li Guang Xiang (1895). The Essence of Xin Yi. ^ Frantzis, Bruce (August 7, 2007). The Power of Internal Martial Arts and Chi: Combat and Energy Secrets of Ba Gua, Tai Chi and Hsing-I (Paperback). Blue Snake Books. p. 432. ISBN 978-1-58394-190-4. ^ "Legends surrounding the Origins of some of the Oldest Schools of Martial Science". Archived from the original on July 9, 2012. Retrieved August 28, 2009.